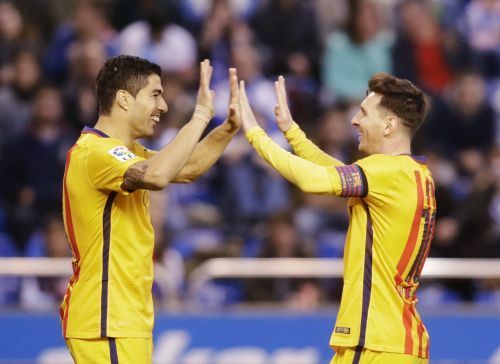 Barcelona bounced back from their worst run of La Liga defeats for 13 years in emphatic fashion as Luis Suarez scored four in an 8-0 thrashing of Deportivo la Coruna on Wednesday. Ivan Rakitic, Lionel Messi, Marc Bartra and Neymar were also on target as Barca reasserted their control on the Spanish title race. Barca's superior head-to-head record keeps them ahead of Atletico Madrid at the top of the table with four games remaining as Fernando Torres's hot-streak continued with the winner in a 1-0 success at Athletic Bilbao. Real Madrid remain a point behind in third as goals from Karim Benzema, Lucas Vazquez and Luka Modric ensured a 3-0 win over Villarreal. However, victory came at a cost as Cristiano Ronaldo limped off holding his right hamstring a few minutes from time. "He got a frIght, but I don't think it is anything serious," said Madrid boss Zinedine Zidane, whose side face Manchester City in the Champions League semi-finals next week. "I am calmer now than when I saw him leave the pitch." Barca's sensational return to form came after having taken just one point from their last possible 12 in the league. "Today is a demonstration that the group is more united than ever and desperate to win the league. It is still in our hands." 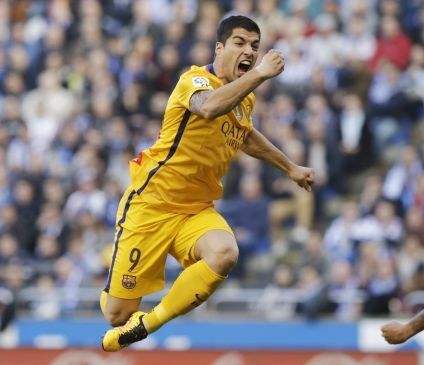 Suarez settled the visitors' nerves after just 11 minutes when he outmuscled Sidnei to volley home. Celso Borges then missed two huge chances to bring Deportivo level as he was denied by Claudio Bravo and a last-ditch block by Bartra before Suarez gave Barca a cushion when he latched onto Messi's sumptuous through-ball to slot low past Manu. Suarez turned provider for Barca's third just after the break when his cross to the back post was volleyed home emphatically by Rakitic. Messi created the fourth with another defence splitting pass and Suarez kept his composure to seal his sixth hat-trick of a prolific season. Suarez was gifted his fourth of the night from Neymar's unselfish cross for his 49th goal of the season. The former Liverpool striker then added a second assist to his four-goal haul as his cut-back was gratefully tapped home by Messi. Bartra joined the party as he galloped forward from his own half before firing into the far corner. And Neymar completed a perfect night for the Spanish champions when he tapped home at the far post for his first goal in six games from Suarez's third assist of a spectacular display. Torres kept Atletico in the race as he scored for the fifth consecutive game with a towering header from Antoine Griezmann's cross seven minutes before half-time in Bilbao. "I am happy because the goals have helped the team win the points that bring us closer to our objectives," said Torres. Victory also came at a cost for Atletico as inspirational defender Diego Godin limped off with a hamstring injury that is likely to see him miss at least the first leg of their Champions League semi-final against Bayern Munich. Real knew they had to win to remain realistically in the race as they kicked off two hours after Barca, but impressed again in racking up an eighth consecutive La Liga win. Benzema headed home his 27th goal of the season four minutes before half-time after Sergio Asenjo could only parry Ronaldo's fierce effort. Vazquez was handed a rare start by Gareth Bale's absence through injury, but took full advantage as he raced onto Benzema's layoff before firing low past Asenjo 21 minutes from time. Modric volleyed home Danilo's cross in sensational style six minutes later to make it 3-0.